This isn’t a necessity, but it helps – most roses are grafted onto a more vigorous set of roots, from a different variety of rose. The problem with this is that if you don’t keep your wits about you, that vigorous rootstock could rise up and overtake the delicate beauty you chose. I usually see this in gardens where the sweet caretaker grew too old to be able to keep up, and after a few years of neglect and weediness, a lot of the roses reverted to the rootstock variety, which rarely blooms and isn’t worth its thorns. I like to think of my gardens as gifts I give to the future, so choosing roses on their own roots is a bit of insurance. As a rule of thumb for the Maritime Pacific Northwest, go for the lowest petal count you can find – that is, look on the packaging of your bare-root rose to see how many petals each flower has (it’s usually listed). The fewer the petals, the less moisture the flowers will hold and the longer each bloom will last in our climate. 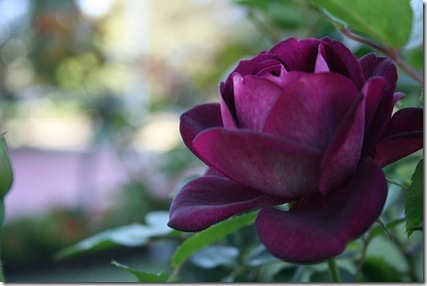 The ideal easy-care rose for our climate has less than 25 petals. If it has many more than that (40’s about the limit here), it will probably disappoint you by starting out with huge, gorgeous buds that turn a manky brown just as they should be opening into fragrant rosy perfection. That’s just a general rule, however: If you are a fan of the ruffles, there are some David Austin roses, bred in a similar climate in England, that do really well here. A client who visited England came back with a passion for them and I’ve been shocked at how well they do – at the first sight of all those frills I cringed, imagining the brown mess of disappointment they’d bring – but they’ve been ace – blooming so mightily that I am often gifted a bouquet in summer! Check out this article for Austin recommendations. If a rose is willing to stick it out in a garden without a whole lot of spraying, chances are that’s an attribute they’re going to be talking about. 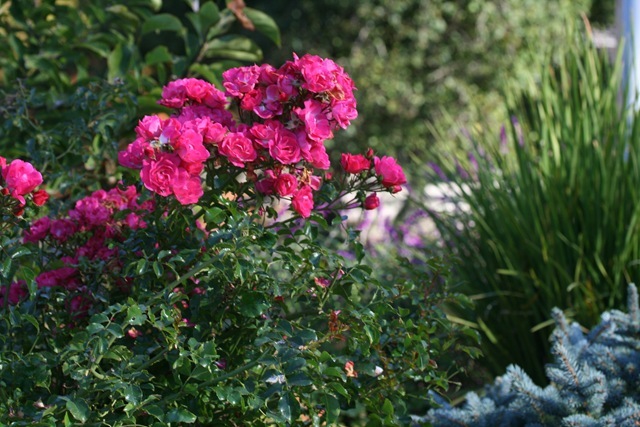 Assume the worst of your roses, and veer away from all the fancypants new varieties unless they are specifically saying how they resist disease – seeing as even the resistant ones still have issues. A few of my favorite, easy care roses? 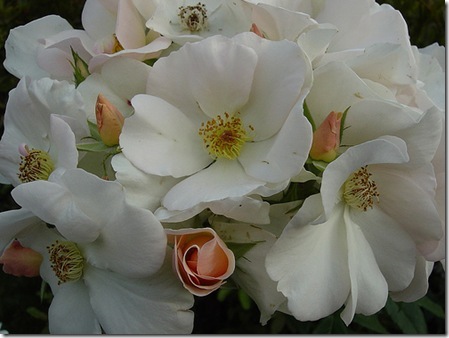 ‘Iceberg’, the best white rose for our climate. 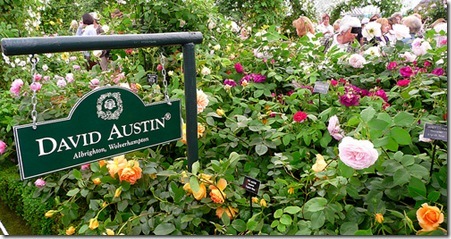 It’s often grown on its own roots, does well with minimal spraying, and has a really long season of crisp white roses. There are also Pink Icebergs, Climbing Icebergs, and the awesome ‘Burgundy Iceberg’ (below) which all have the same good qualities as the original. ‘Gourmet Popcorn’ is a fun miniature rose with a flurry of tiny white floofy flowers with yellow centers. They’ve proven disease resistant here on the foggy coast in both landscapes and containers. The stems aren’t long enough for cutting, but hey – they are adorable, bloom profusely all season, and I have never had to treat mine for pest problems. ‘Bonica’ is a sweet shell-pink bloomer with lovely dark green foliage. I love how the roses aren’t quite the traditional shape –they are a little looser and less formal. Good cut flowers and a pretty 5’ tall habit. ‘Sally Holmes’ is an old-fashioned pinky-white shrub rose which is super disease-resistant! In all these years, I have never once seen it with even the smallest bit of black spot. It grows to a strong 6’ tall and wide shrub, and if it weren’t for all of the deadheading of those big bloom clusters (this gal blooms almost constantly all summer even into November), I’d consider it a low-maintenance plant. It’s usually not grafted. ‘Sally’ starts off white but quickly turns a pretty pale pink as each flower ages. Again, not much of a cut flower – the petals go everywhere – but what a stunner for the garden! ‘Zephirine Drouhin’ is a pretty raspberry-pink thornless climber which tolerates tough conditions – lousy soil, a bit too much shade… It’s the only rose I like to plant on a heavily used arbor, because – hey, have you ever caught your face on a thorny branch while walking by? I have, and that’s why I like the non-thorny ‘Zephirine’! Her fragrance is fresh and fruity – not too heavy. Hope this gets you all inspired to check out the bare-root selection at your local nursery. If you are ordering online, may I recommend Regan Nursery? They have a lot of great varieties and obviously care deeply about roses and the people who love them. I get the David Austin catalogs just to look at the photos and daydream about the rose gardens I’ll plant when I have my own yard. Although I do like single roses too. Whoa! I totally never heard that about the grafting not being kosher! Thank you, next time I have Jewish clients I’ll be sure and pull that bit of knowledge out. I was just paging through that new Timber Press book on biblical plants the other day – I should pick up a copy for myself and learn some more. I’m not religious in the least, but I’m fascinated by ancient beliefs and uses of plants. I think of us as living in the ultimate information age, but they knew a lot back in biblical times, too – a lot of good stuff which we have largely forgotten in our rush forward. Hi Genevieve, I have read everything on this page and want to say well done! So much good information, no matter where you live. I am trying not to fall in love with that purple iceburg rose, but love the color too much to resist! Thank you so much for your kind words, Frances – they mean so much to me! Even more so because I love your blog so! Isn’t that Purple Iceberg delectable? I confess a love of Goth plants, and I can imagine that going gorgeously with some of my wicked favorites! My mother had the Sally Holmes roses in her garden.. It’s sad for me now to look at those pictures and think back about how much time and effort she used to put in it! Now (sadly) she is older and can’t be outside as much, but I am trying to start my own little bit of her garden and that’s what brought me to the site. Thank you for the info.